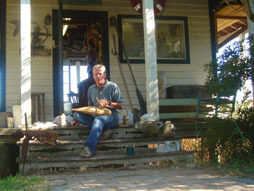 Reg Birch, a carver from Chincoteague Island, Virginia U.S.A.
Reg Birch's family has been living in this tiny Atlantic coastal town for six generations. The splendor of its nature and wildlife he has always loved. It was this love of nature and the sport of hunting waterfowl which finally brought him to his profession of carving. His involvement with the art of carving began as a simple hobby in 1977. Making his own decoys for personal use had sparked his interest in the decoy carving world. He began going to local shows; first just to purchase supplies. Hereby, he discovered a whole new world of decoy carving. However, it would take him nine years of experimenting with different approaches to this trade before he decided to make this his professional career. His first choice was to carve miniature waterfowl for approximately two years. As time went by, he progressed to create full-scale decorative birds; doing fine detailed carvings. In the process he entered a few shows to display his work. There he got interested in old working decoys. He started purchasing and bartering for a few of the old masters' works, just for collecting purposes, not knowing that this interest in old decoys would eventually lead him to his current profession. As a hunter at heart, he was very much inspired by the working decoy competitions. So he decided to try his hand at this type of decoy making and in doing so he accumulated more than 250 winning ribbons for his work over a period of about five years. Eventually, he was being asked to judge at several shows instead of entering the contests himself. Copyright (C) 2011 Reggie Birch. All rights reserved. Website designed and developed by World One Communications, LLC.